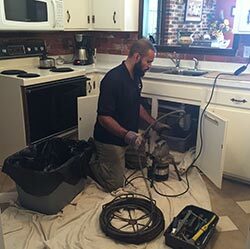 If the drains in your Rochester, NY home or business are running slow, it’s probably time for a drain cleaning in Rochester NY. You can try to clean them yourself, or you can call your local plumber and let them worry so you don’t have to! If you want to try cleaning your drains yourself first, the easiest way to do so is with a chemical drain cleaner. You can buy these most places where cleaning products are sold. The cleaner will come with instructions, and you will want to be sure to follow those so that you don’t damage your pipes. Usually, you will pour a measured amount of the cleaner down your drain, wait a period of time, and then try running water down your drain again. You can also rent a snake for drain cleaning in Rochester NY, if you are brave. This can be dangerous because, unless you are trained, it is easy to get the snake stuck in your drain. Make sure you run your snake into the drain slowly and stop at any sign of resistance. In addition, most plumbers advise that you don’t run more than 3-5 feet of snake before you call someone, since running more than that raises your chances of a problem. If you can’t get the clog out yourself, give us a call. After all, unclogging drains is one of the things we do best! Our professional plumbers will come out when it’s convenient for you and use their professional grade snakes to solve your problem. They will know what size snake to use and how to utilize it in a way that won’t damage your pipes. A professional plumber can also check to see if there is a reason for your clogged pipes, especially if you are having regular clogs. Sometimes, there can be foreign objects stuck in your pipes or residue that has built up, narrowing the size of the pipe. They can remove these problems so that your pipes can drain freely. Occasionally, pipes that clog repeatedly are indications of a problem in your sewer, rather than in the plumbing inside your home. If that turns out to be the case, we can handle those repairs, too. No one wants for face a sewer problem, but we will stand by your side and make sure that you have everything you need to make good decisions about when to repair and what method to use for your repair. Many times, a drain will clog slowly and you will have ample time to get it clean before there is an emergency. Occasionally, though, a clog will happen quickly and you will need to call your trusted plumber quickly for a drain cleaning in Rochester NY. If that happens to you, rest assured that we are here. We’ll be out as soon as possible, and we will fix your problem so that a minimum amount of damage is done. Our plumbers are reliable, skilled, and fast, so we will be in and out as soon as possible, leaving you with your home or business back to normal.